Open daily 6:30 a.m. to 10 p.m. When I visited the Signature Grill at the JW Marriott Starr Pass back in October (see "Mixed Views," Oct. 16), I fell in love with the view, but was vexed by the hit-and-miss food and service—and downright annoyed by the restaurant's Web site, which featured outdated menus and specials. After that review, the folks at the Starr Pass asked us to give the Signature Grill another chance; we agreed, per our policy, to come back after at least three months had passed. I am happy to report that we found delicious food and fine service upon our return. But that damn Web site still needs an update. As of this writing, the online dinner menu is offering a "signature autumn sampler," with an appetizer/soup/salad, an entrée and a dessert for $39. Great deal ... but autumn? That online menu displays a diverse dinner offering of about 16 entrées. The reality at the JW Marriott: a dinner menu with seven entrées. 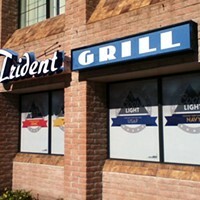 It seems the recession has hit the Signature Grill menu, with management choosing to trim the offerings down to the best of the bunch. This may not be a bad strategy: Everything we had was fantastic. They're still offering that fantastic sampler special for $39, so we indulged. I picked the deconstructed tortilla soup (separately $8) as my starter, and Garrett chose the tableside guacamole ($10); plus, we added on one of our favorites from our first visits, the rock- shrimp ceviche ($10). For entrées, Garrett got the shrimp-crusted opakapaka with sun-dried totato polenta and chipotle beurre blanc ($32), and I picked the pecan-crusted lamb with jalapeño cornbread pudding ($33). As we waited for our appetizers, we took in the view of the city's lights taking effect as the sun set, and of guests frolicking in the hotel's lazy river. Garrett savored the white-wine sangria ($8) that the bar whipped up for him, even though it's not on their menu, while I enjoyed a Maker's Mark and Coke ($7) and munched on the warm jalapeño cheddar bread. Whereas service was up and down during our visits back in October, our server was prompt, friendly and helpful this time around. The starters were all delightful. The ceviche was again a success—I love those pickled onions!—and the tableside guacamole—a dud the first time around—was quite tasty, with jalapeños, tomatoes, garlic, cilantro, onion and salt all enhancing the avocado base. My soup, delivered in a small cast-iron vessel, was also good—it was more of a chicken soup than a true tortilla soup, but I liked it, and the "deconstructed part" was cute: You choose how much lime, cilantro, spice and tortilla strips to add. The entrées seemed slightly delayed, but they were worth the wait: The lamb was the best I have ever had. My only complaint about the juicy, flavorful, chops (two of them, with two bones in each) was that I wanted more. The cornbread pudding, delivered in a miniature iron skillet, was practically molten at first, but as it cooled, the flavors came out of hiding nicely. Garrett's opakapaka (read: snapper) was fantastic. We couldn't taste that much shrimp, but the flavor of the tender fish, the creaminess of the polenta and the subtle heat of the buerre blanc meant the shrimp was not missed. The meal was amazing—probably one of the top 10 we've had in Tucson—but we decided to give our stomachs a break by getting our desserts to go ($9 separately). The green apple crisp was only OK, but the cinnamon ice cream that accompanied it was exquisite; the chocolate cake hit the spot.